Tuesday, for those of you who may not be paying attention or haven’t set an Outlook reminder, is Valentine’s Day. For some, it’s a gift-giving occasion. For others, it’s a dinner out. For those who are in a long-term relationship, it may even be a challenge to come up with an original gift. To paraphrase Don Cheadle’s character in the movie Ocean’s 13, you never run the same gag twice. One of those “challenges” may be heading out to dinner with your significant other. Your budget can survive Valentine’s Day dinner if by considering some a variety of options. Look For Specials. Some restaurants offer “dining for two” specials that may save you some money, or provide an opportunity to eat at a high-end restaurant. Similar to what some of the chain restaurants do for their “dinner for two” offerings, Valentine’s Day is an opportunity for restaurants to group specific dishes together to highlight chef specialties. 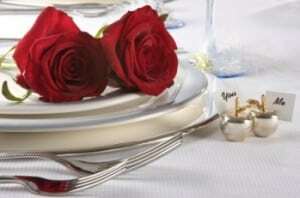 The detriment is on Valentine’s Day, due to the additional volume of patrons, menus may be limited at some restaurants. It may also be to your advantage to make reservations. Instead of waiting in the restaurant lobby or bar area, making reservations can have your table waiting, as long as you arrive on time. Choose An Alternate Date To Celebrate. If your date doesn’t mind celebrating Valentine’s Day on a day other than the actual holiday itself, this may be the best move. As stated earlier, the high volume of patrons influences some restaurants to limit menu items. By celebrating on a different day, you open up your menu options. More importantly, you won’t be waiting around just to sit at a table, saving another valuable resource – time. For those restaurants that do not take reservations, wait times are extended on Valentine’s Day. Best bet to avoid the wait times is to schedule your celebration for another day, and odds are you will enjoy shorter wait times. Cook Dinner At Home. This may sound too cliché, but cooking a romantic dinner at home can be fun! First, you get to show off your culinary skills, as well as to make a favorite dish or add your own spices & flavors. You also get to set your individual mood for dinner, including lighting or candle light, and favorite music. Remember, Valentine’s Day dinner isn’t necessarily about where you go, but the quality time spent with your significant other. Cooking dinner at home may take extra effort, but it also provides an opportunity to save on spending. There is nothing wrong with eating out on Valentine’s Day – taking the time to celebrate with the person you love. However, heading out for an expensive meal can take a significant bite out of your weekly or monthly budget. Dining specials at higher end restaurants are one way for you to experience the next level of culinary achievements while saving a few pennies, even if the menu is limited. Choosing an alternate date will help you save on another valuable resource – time. And cooking a romantic dinner at home for your mate can be even more satisfying then spending the cash out, as you can set your own tone for the evening. In any of these directions you shoot Cupid’s arrow, you are bound to create a quality memory and reduce your costs.